The Omega Speedmaster is one of the world's most famous chronographs. It went down in history as the first wristwatch on the Moon. Today, this beloved collection is composed of innumerable models: from the classic Moonwatch to high-end timepieces. Coveted models: "Snoopy Award," "Speedy Tuesday"
Every watch enthusiast knows the Omega Speedmaster. Most fans associate this Omega watch with the first Moon landing in July 1969. However, today the Speedmaster is so much more than just the so-called "Moonwatch." The collection is composed of numerous models: from manual chronographs to especially precise quartz watches with analog and digital displays, to automatic timepieces with state-of-the-art Co-Axial calibers. Top watches feature an Omega Co-Axial Master Chronometer caliber with a moon phase display, pointer date, and magnetic resistance of up to 15,000 Gauss. These Speedmasters stand up to magnetic fields and remain uninfluenced by everyday electric appliances. Omega regularly releases special limited editions of the Speedmaster. These series tend to sell out quickly due to their extremely limited numbers. Since they are so popular among Omega fans, they often increase massively in price within a short period of time. One example is the Speedmaster Speedy Tuesday Limited Edition , which the Biel-based manufacturer introduced in 2017 to celebrate five years of #speedytuesday. 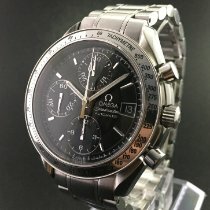 Speedmaster fans the world over use this hashtag when posting their watches and updates. Limited to 2,012 pieces, the Speedmaster Speedy Tuesday had an original list price of 6,500 USD. Since then, prices have climbed to around 8,800 USD. The Omega Speedmaster Apollo 13 Silver Snoopy Award has experienced a similar jump in price. The version with a white dial officially costs 7,350 USD. If you'd like to purchase an example from 1970, you'll need over 19,400 USD for a model in mint condition and more than 15,900 USD for a pre-owned piece. The first Snoopy special edition appeared in 2003, has a black dial, and was limited to a run of 5,441 pieces. Pre-owned versions demand a good 10,800 USD and have also risen in value over the last few years. 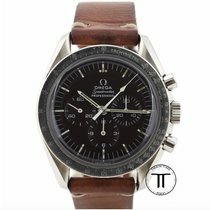 How much does an Omega Speedmaster cost? Are you looking for a watch with an impressive history and state-of-the-art technology? The Speedmaster collection offers a large selection of chronographs. The manufacturer emphasizes the functional nature of these watches, differentiating them from those in the De Ville collection. This allows the more classic, elegant De Ville dress watches to fill another role in Omega's catalog. The Speedmaster Professional Moonwatch is easily the most famous model in this collection. When someone hears the word 'Speedmaster,' they likely think of this space-faring timepiece. Omega still offers this watch with the legendary manual caliber 1861 and Hesalite. Hesalite is a brand of acrylic glass, which is a transparent plastic material. You can purchase a mint-condition Moonwatch chronograph for just over 3,600 USD. These watches tend to retain their value: pre-owned examples are only a few hundred dollars less expensive. Fans of vintage watches should enjoy the Omega Speedmaster Professional with the reference number 145.022 . The manufacturer introduced this model in 1968 and produced it until the early 1980s. There are plenty of examples on the market, some even in mint condition. Plan to spend about 7,400 USD on such a timepiece. Pre-owned watches sell for around 5,700 USD. The models 105.012 and 145.012 are much rarer. The caliber 321 powers both watches. Buzz Aldrin was wearing his ref. 105.012 as he became the second person ever to set foot on the Moon. Prices for this reference number sit around 12,900 USD pre-owned. The ref. 145.012, also a part of the Apollo 11 mission, costs about 9,000 USD. If you would like to call an Omega Speedmaster your own but find the Speedmaster Professional Moonwatch too expensive, you should take a closer look at the Speedmaster Reduced . At 39 mm, it is 3 mm smaller than the Moonwatch, making it the perfect size for both slender-wristed men and women. What's more, the automatic Omega caliber 3220 ticks away inside the Reduced. This movement is based on the ETA 2890-A2 and features a chronograph module from Dubois-Dépraz. The dial also has some distinct features: from Arabic-numeral minute markers to the position of the subdials, which sit closer to the edge than they do on the Professional Moonwatch. Omega no longer manufactures the Speedmaster Reduced, so you'll have to look to the vintage market for this timepiece. Even though the prices have increased in recent years, you can still purchase a Reduced for less than 2,100 USD. With any luck, you may even find a never-worn example for around 2,500 USD. Like the Reduced, the Omega Speedmaster Date is one of the more affordable Speedmaster models. This watch also features an automatic caliber, namely the Valjoux-7750-based 1155, with subdials at 6, 9, and 12 o'clock. The date is located at 3 o'clock. Pre-owned watches make a great entry point into the Speedmaster series, with prices of around 1,800 USD. Retro watches have been in style for a while now, and the Speedmaster '57 is no exception. As its name suggests, this watch was inspired by the ref. CK2915—the original Speedmaster from 1957. Its most distinctive feature is its so-called Speedmaster Broad Arrow hour hand. Original models from the 50s often sell for several hundred thousand dollars at auction. Omega has crafted numerous homages to the original Speedmaster. The version from 2017 is perhaps the most highly coveted. It is limited to a run of 3,557 pieces and was released in celebration of the Speedmaster's 60th anniversary. The classic Speedmaster caliber 1861 powers these 38.6-mm chronographs. Plan to spend about 8,000 USD for a new watch from this series. Pre-owned versions change hands for around 7,600 USD. The Speedmaster 60th Anniversary was released at the same time as two other limited editions: the Seamaster 300 and the Railmaster. The Speedmaster '57 is also available with Omega's state-of-the-art Co-Axial calibers. These models are not limited editions and, at 41.5 mm, are larger than the 60th Anniversary version. You can purchase one of these Co-Axial chronographs for about 5,800 USD in mint condition and 5,500 USD pre-owned. Omega introduced a new edition of the first Speedmaster back in the late 1990s: the Speedmaster '57 Replica . The caliber 1861 also powers this model. You can get a pre-owned example for around 3,000 USD. Never-worn versions are hard to find since Omega stopped producing this retro watch years ago. The Speedmaster collection also includes wristwatches made of high-tech ceramic. Ceramic is much harder and more scratch resistant than stainless steel. The ceramic Speedmaster comes in gray, white, or black. The black edition is known as the 'Dark Side of the Moon' and is dedicated to the astronauts of the Apollo 8 mission. They were the first people to ever see the far side of the Moon with their own eyes. Modern Co-Axial caliber technology provides this timepiece with high precision. A never-worn Omega Speedmaster Dark Side of the Moon costs around 8,000 USD. Pre-owned examples are a few hundred dollars less, coming in at around 7,300 USD. From a color perspective, the Omega White Side of the Moon is the complete opposite of the black ceramic model. Its white case is also inspired by the Moon, though this time by the bright side that illuminates the night sky. Thanks to its white color scheme, this watch feels much more feminine. Mint-condition pieces demand around 8,200 USD, while pre-owned pieces sell for about 7,300 USD. The Omega Speedmaster Grey Side of the Moon is the third watch in this series. Its gray coloration is inspired by moondust. It also corresponds to a statement made by American astronaut Jim Lovell, who said, "The Moon is essentially gray." You can purchase the Grey Side of the Moon for about 8,300 USD new and 7,200 USD pre-owned. The watches of the Speedmaster Racing series represent Omega's long-standing relationship with motorsports. Before the Speedmaster became the legendary Moonwatch, it was the companion of many a racecar driver. The dials of the Racing models are reminiscent of the dashboards found in classic racecars. This chronograph is currently available in a number of editions and in various sizes. Mint-condition, 44-mm models cost around 6,300 USD. Pre-owned watches are slightly more affordable at about 5,600 USD. If 44 mm is too big for you, there is also a 40-mm version. You can get this timepiece for as little as 3,400 USD new and 2,600 USD pre-owned. High-precision Speedmaster quartz watches are packed with functionality to meet professional needs. For example, the Speedmaster Skywalker X-33 was developed specifically for astronauts. This 45-mm watch has both analog and digital displays. The movement also comes with a perpetual calendar, three alarms, a chronograph, three time zones, and a countdown function. All of this is topped off by two special functions: the Mission Elapsed Time (MET) and Phase Elapsed Time (PET). The MET shows either how much time has passed since the mission began or how much time is left. On the other hand, the PET shows how much time has passed since a particular phase started. You can program this quartz watch with three phases, which then depend on the MET. The Omega Skywalker X-33 is the official mission watch of the European Space Agency (ESA). If you're looking for a professional astronaut's watch with an accurate quartz caliber, the Speedmaster Skywalker X-33 is the right watch for you. Prices range from around 3,400 USD for a pre-owned model to 4,000 USD for a mint-condition timepiece. The Speedmaster Skywalker X-33 Solar Impulse is limited to a run of 1,924 pieces and costs about 4,300 USD new and 4,000 USD pre-owned. The Omega Spacemaster Z-33 is yet another quartz member of the Speedmaster family. Its distinctive design is inspired by the Omega Flightmaster from the 60s and 70s. Like the Skywalker X-33, the Spacemaster Z-33 features both analog and digital displays. The 43-mm case is made of titanium and is water resistant to 30 m (3 bar, 98 ft). In terms of functionality, it comes with a chronograph, an alarm, multiple time zones, and a perpetual calendar. Plan to spend around 6,400 USD for a new Spacemaster Z-33. Pre-owned pieces are markedly more affordable at 3,700 USD. The Professional is still the most significant and renowned Speedmaster model. If any wristwatch has earned the title of "famous," it's this one. On July 20, 1969, the first human beings landed on the Moon, equipped with the Omega Speedmaster Professional . Not only did the astronauts endure a long and arduous selection process, but the watches did as well. NASA subjected select mechanical watches to harsh conditions: extreme temperatures from -18 to 93 °C (-0 to 200 °F), vibrations, excess and vacuum pressure, and many more. In March 1965, it was determined that the Speedmaster Professional performed the best and thus, it joined the crews of the Gemini and Apollo missions. Unfortunately, an oxygen tank exploded during the Apollo 13 mission in April 1970, causing significant damage to the spacecraft. In order to return to Earth safely, the astronauts had to change course. The crew had to burn their rockets for exactly 14 seconds with a maximum deviation of 10%. A minor error would have sent them past Earth, lost in the vastness of space. The Speedmaster was used to time the correction and proved itself once again—the maneuver was, of course, successful. Upon the astronauts' safe return home, NASA awarded the Speedmaster with their highest honor, the Silver Snoopy award. In 2015, Omega celebrated the 45th anniversary of Apollo 13's safe return home with the Moonwatch Anniversary Limited Series. The Peanuts character Snoopy, the namesake of NASA's award, graces the subdial at 9 o'clock. A 925 sterling silver medallion featuring Snoopy in space is located on the reverse side under the sapphire glass case back. The watch also features a white dial, unlike the usual Speedmaster Professionals with black dials. The true Omega classic is the Speedmaster Moonwatch Professional 42 mm, which traditionally features a manual caliber and a stainless steel case. The chronograph in this watch, the same one used during the Apollo missions, has remained nearly unchanged for decades. The black bezel features a tachymeter scale. The 30-minute counter is located at 3 o'clock, and the 12-hour counter sits at 6 o'clock. The decentralized seconds is positioned at 9 o'clock. However, there are a few changes from the original model. The hands and index markers no longer use the radioactive material tritium to achieve their luminous effect. Instead, they use SuperLuminova. Additionally, Omega now utilizes scratch-resistant sapphire glass instead of Plexiglas. Most die-hard Speedmaster fans can live with these modifications. Omega stays true to tradition with the watch's movement, however. The manual caliber 1861 is the same one that was worn on the Moon and has a 48-hour power reserve. Omega returns to the Speedmaster's roots with the Speedmaster '57. The Speedmaster derives its name from its original purpose as a watch for timing car races and other sporting events. Omega produced the first Speedmasters in 1957. They had bezels featuring tachymeter scales, which allow for the calculation of speed based on time and distance. Omega has returned to these historical models with the new '57, which debuted in 2015. The watch has a tachymeter scale and the hour hand has a triangular tip, while the minute hand ends in an arrow point. The Racing model is even more geared toward racing than the Speedmaster '57. It features a stopwatch function and a tachymeter scale. The three chronograph hands and a line along the tachymetric scale add luminous yellow accents to the otherwise gray and black design. It's rounded out by a rubber strap with "Speedmaster" written in yellow. The band's pattern resembles a tire tread or asphalt on a racetrack. The Racing is run by a mechanical movement and is a good alternative to the Rolex Daytona. The Spacemaster Z-33 is a unique addition to the Speedmaster collection. Its case was inspired by the Flightmaster 1969 from Omega's Pilot's Line. The rest of it, however, is completely modern. It features a digital display as well as an analog. Four large push-pieces jut out from the 43-mm titanium case. The digital display on the dial can display UTC time (synonymous with GMT) and two other time zones, as well as a perpetual calendar, an alarm, a stopwatch, and a countdown timer. The red LED lighting on the black background adjusts its intensity based on the brightness of its surroundings. Three large hands are located in front of the digital display and tell time in the traditional analog fashion. The Spacemaster Z-33 owes its multifunctionality to a quartz movement. The movement compensates for minuscule deviations in precision caused by fluctuations in temperature, making it even more precise than regular quartz movements. A more traditional pilot watch is the Breitling Navitimer. The Skywalker X-33 is also powered by a quartz movement and features an analog/digital display. It was designed with the needs of space flight in mind and can be considered the modern successor of the traditional Speedmaster Professional. It has a 24-hour display, alarm, stopwatch, and a bidirectional rotatable bezel, among other features. The watch's case is made of titanium and is 45 mm in diameter. The Speedmaster Mark II has been a part of the collection since 1969. It features a bezel with a tachymeter scale embedded in a stainless steel case, making it well protected against scratches. The chronograph's central second hand and the hour markers stand out in fluorescent orange against an otherwise black and white dial. Omega powers the Mark II with a mechanical caliber featuring a silicon balance spring. Anti-magnetic silicon is increasingly being used in high-quality watches. A pioneer in the use of this material was the manufacturer Breguet. The Speedmaster HB-SIA occupies a special position within the series. Its namesake is the Solar Impulse aircraft, registered as HB-SIA. This solar energy project is run by Bertrand Piccard and André Borschberg and funded by Omega. The Speedmaster HB-SIA models are chronographs with automatic movements. The GMT function keeps track of a second time zone with its separate hand. The case has a diameter of 44.25 mm and is made of titanium to keep it light. Omega preferentially implements a Co-Axial escapement in both the HB-SIA and the other mechanical movements of the Speedmaster collection. This relatively new technology improves the caliber's stability and precision. Louis Brandt founded the company in 1848 under his own name. A pocket watch series from 1894 was the first to carry the word 'Omega'. The name is taken from the last letter of the Greek alphabet, which symbolizes completion. At the turn of the century, Brandt's successors decided to adopt Omega as the company's name. Omega introduced their first chronograph in 1942, which is considered the predecessor to the later Speedmaster. The chronograph was powered by caliber 27 CHRO C12 and could time up to 12 hours. The first Speedmaster was brought to the market in 1957. In 1963, Omega released a new version, which would become famous around the globe: the Professional. Over the following decades, Omega continued to add to the series. Today, the Speedmaster collection also includes quartz watches with digital displays and countless additional functions. However, the models from earlier years have remained almost unchanged.